A disadvantage of gaining the Mangekyo Sharingan is that it leads to blindness over time. We have seen Madara, Itachi and Sasuke, all wielders of the Mangekyo Sharingan, use Susanoo. All three have gone blind or have worsened eyesight at some point*. 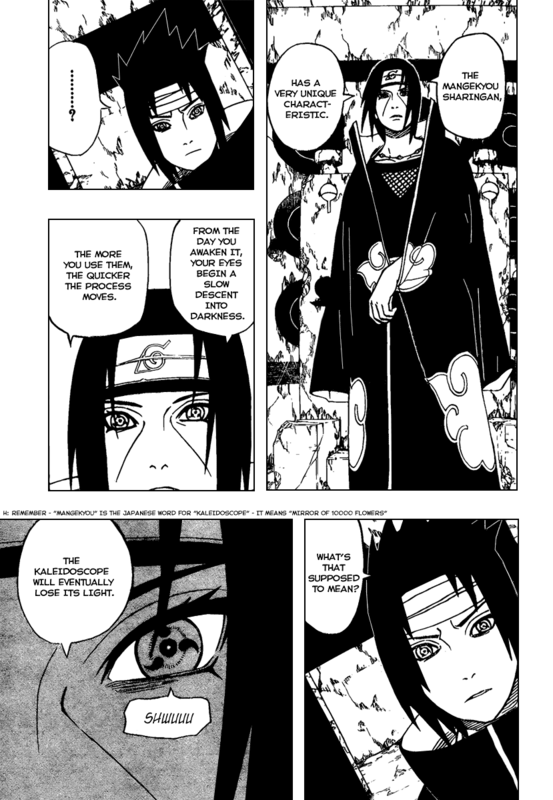 Itachi and Sasuke have also been shown using Amaterasu which makes the eyes bleed afterwards. Danzo Shimura, Obito Uchiha and Kakashi Hatake, also wielders of the Mangekyo Sharingan, on the other hand, have never used any of the above techniques and have never shown any sign of blindness*. Why didn't they go blind or have worsened eyesight? What causes the blindness effect of the Mangekyo Sharingan? How does the Mangekyo Sharingan eventually blind its wielder? *Please correct me (or suggest an edit) if I'm wrong. Also, please feel free to suggest edits adding what chapters the events mentioned above happened, so question answerers can review it. An original Mangekyo Sharingan puts a strain on the eye. The ocular muscles are placed under a constant strain due to the unique chakra the Mangekyo consumes. That strain causes the user to gradually go blind. Another person's eye doesn't (for some reason) produce the same strain. So the user's vision is intact. Itachi - Awakened his Mangekyo on his own, going blind. Sasuke - Awakened his Mangekyo on his own, gone almost completely blind, then took Itachi's eyes, and got his vision back. Madara - Same as Sasuke. Kakashi - Remember that the eye didn't originally belong to him. His Mangekyo is more similar to an Eternal than a normal one. Obito - Presumably, it's because Obito has a high concentration of Hashirama Senju's cells. These constantly heal the eye, preventing it from going blind. Danzo - Same as Kakashi, the eye didn't belong to him. Although using Sishui's eye did put a huge stress on his chakra and body. So if someone was born half Senju or half Uzumaki and half Uchiha it is possible that one gains a pseudo-eternal mangekyou. 6 paths chakra also has some effect in the same way. Eyes plus Body of the sage = a balance in visual and physical prowess plus a chakra reserves that surpasses either bloodline. I have made several OC's where this is the case. Obito Uchiha, half his body was grafted from Senju DNA his chakra was already mixed with it to the point when he awakened his mangekyou with it he could perform a combo of wood style and kamui which proves to be very deadly. that aside after that his eye suffers no bad side effects as opposed to Kakashi even after repeatedly using it for over a decade. That is because the chakra used in that eye is a combo of Senju and Uchiha chakra it heals his eye just as fast if not faster than the damage caused. His right eye was still in his body and his right side is what was grafted onto him with Senju dna. Obito Uchiha is the only canonical evidence of this being the case. 6 paths chakra has also been known to negate and heal the side effects of mangekyou overuse as explained in Indra Otsutsuki's case and Kakashi after gaining both mangekyou in his eyes via Obito possession power up. Kakashi hasn't gone blind because his eye isnt actually his so side effects are less severe plus every time he uses it, it KO'd or killed him, like in pains arc. Unlike most, I have watched the entire anime and read the entire manga. Why do some characters not have surnames?